Hundreds of workers marched in the city on August 24, protesting the inadequate salary increase of a mere Rs. 500 a month. 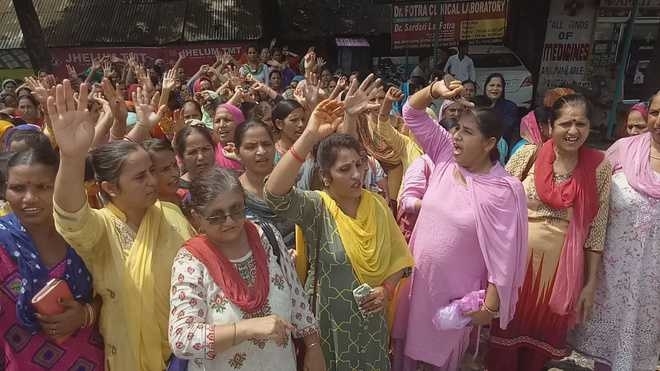 Anganwadi workers and helpers in Jammu are protesting the meagre salary hike, which reportedly has not met their demands. Hundreds of workers gathered and marched in the city of Jammu on August 24 against the decision of the administration to hike their monthly honorarium by a mere Rs 500. Marching under the banner of Anganwadi Workers and Helpers Association, the workers shouted slogans against the Jammu and Kashmir government, condemning its indifference. “We work tirelessly, not for this meagre hike of Rs 500 per month. We urge the state to implement SRO-520 for Anganwadi workers and helpers. For the work we do, we should be paid equal to the government employees,” one of the protesters said. As per the sources, the workers and helpers have been getting monthly salaries of Rs 3,600 and Rs 1,800 respectively. According to reports, the ‘Jammu & Kashmir Casual and Other Workers – Regular Engagement Rules 2017’ outlined in SRO-520 – issued by the Finance Department – aimed at benefitting nine categories of such appointees, including daily-rated, casual, seasonal, HDF (Hospital Development Fund) and local fund workers, NYCs, land donors and ad-hoc/contractual appointees, who were left out under the J&K Civil Services (Special Provisions) Act, 2010, for want of eligibility criteria. The policy also aimed at taking care of ITI-trained workers engaged by various departments. "Yes, Mehbooba Mufti government had assured the regularisation of workers. Even an order was passed but the SRO-520 has not yet been implemented. It included regularisation of jobs and promotions based on seniority. Nothing has happened," said an Anganwadi worker from Kishtwar district of Jammu. Meanwhile, Anganwadi workers have appealed to the new Governor Satya Pal Malik for the revision of wages. “We held a rally and dharna in support of our demands. We want our wage to be increased. We are being paid peanuts for the work we do. We have a family to look after. We are ready to launch a mass agitation if our demands are not accepted by the government,” said one of the protesters. The workers warned they would intensify the protests if their demands were not accepted by the governor. Earlier in the year, the workers launched an 83-day strike, and as many as 30,000 Anganwadi centres were shut in the Jammu region. Their demands included release of their salaries, fixation of the final seniority list, holding departmental promotion committee meetings, implementing the new pension scheme, better working conditions and a hike in honorarium. “We are giving a final ultimatum to the government. We believe that the new governor will acknowledge our demands, and solve our grievances; else, be ready for the mass protest. We want our salary to be increased to Rs 10,000 for helpers and Rs 18,000 for workers,” said one of the protesters. Currently, there are about 28,000 Anganwadi workers and helpers in the state.